We are always searching for fun, interesting and unique birthday party ideas for kids, tweens and teenage parties! If you have a great idea that you would like to share with other birthday party planners send it in! If you would like to contact us about the website or have a suggestion on how we can improve please let us know! If you would like to share links or advertise your product or service on our website please use the below links. We look forward to hearing your ideas, thoughts, suggestions and great party ideas! Thank you for taking the time to send in your favorite birthday party ideas. Birthday Party Ideas for kids, tweens and teenage parties ages 1, 2, 3,4 ,5 ,6 7, 8, 9, 10, 11, 12, 13, 14, 15, 16, 17 and 18 years old. Birthday Party themes, party games, sleepover and slumber party games and ideas, scavenger and treasure hunts, party activities, party favors, goody bags, party crafts, outdoor games, summer, winter, fall and spring party ideas and party food ideas. Truth or Dare questions and dares, Would you rather game questions, minute to win it games. 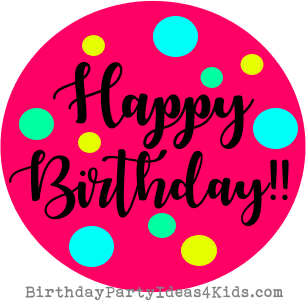 Get the party started with fun, easy and inexpensive party ideas from Birthday Party Ideas 4 Kids!